Download here the driver for the Epson L110 printer, if you have any questions write a comment. The Epson L110 printer with ink tanks integrated from the factory, is the best choice you have for domestic printers today. It is only printer line with Epson ink tanks, the first manufacturer to introduce printers are manufactured systems. 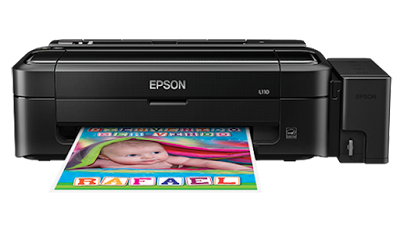 Previously the Epson L100 printer, this was the first of its kind sold by the manufacturer, its ability to print at the lowest cost of the market is strong sold, but print quality is not the best or the purchase price. The procedure to download the drivers from the manufacturer's website Epson is simple and the most recommended, and the only way to get some free drivers malware or viruses. Compatibility with your printer drivers downloaded from the website of the manufacturer is guaranteed, thanks to the ability to segment your printer model and choose the appropriate drivers. I download driver installation is only necessary if you have the Windows XP operating system, modern systems of Windows Vista on do not require downloading drivers through automatic updating from Windows Update. Follow the link below to go to the manufacturer website where you will get the support controllers with Epson L110 printer. If you have trouble installing the drivers follow the procedure on how to install the drivers in case of problems, in case of using Windows 7 see our guide on how to install a driver for this operating system.